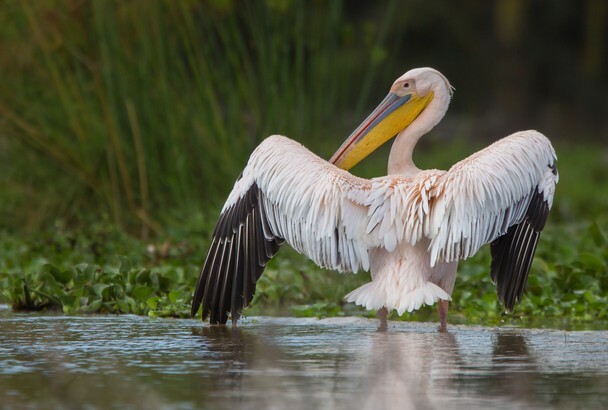 Also referred to as Pelecanus rufescens, the pink-backed pelican belongs to the Pelican family and a notable resident breeder in the shallow lakes and swamps along with waterways such as Kazinga channel where it is always viewed on Uganda Safaris and tours. The pink-backed pelican is a small pelican but not a small bird stretching from 125 – 155cm in length and 4 – 7kg in weight not forgetting a wingspan of 2.15 – 2.9m. Its bill is 30 – 38cm. Regarding the plumage, the pink-backed pelican is grey and white with its back marked by a pinkish hue. It has a greyish pouch while the top of the bill is yellow as always viewed on birding safaris in Uganda. The long feather plumes on the head are present among the breeding adults. The pink-backed pelican thrives in aquatic habitats but it prefers backwaters that are quiet and shallow and would avoid steep vegetated lake banks. It prefers lakes with fresh waters and large slow flowing rivers along with seasonal pools. However, the pink-backed pelican can as well thrive in saline or alkaline lake and lagoons. They commonly roost and breed in trees like mangroves but can as well do the same on cliffs, sandy islands, sand dunes and coral reefs. The nesting trees feature many nests close to one another and these nests are utilised year after a year until the trees collapse. The nest is put together with sticks and is always around 10 – 50m from the ground as often viewed by birders on a Uganda Safari tour. The female pink-backed pelican lays two (2) – three (3) eggs and the chicks feed by picking the partially digested fish from the adult’s pouch. The pink-backed pelican majorly feeds on fish like Tilapia and Haplochromis along with amphibians. Regarding conservation, the pink-backed pelican is listed as species of Least Concern under the red list of International Union for Conservation of Nature (IUCN). In Uganda, the pink-backed pelican can be explored along Kazinga Channel in Queen Elizabeth National Park and on the shores of Lake Victoria. It can thus be included on the list of what to look out for while planning birding safaris to Uganda.